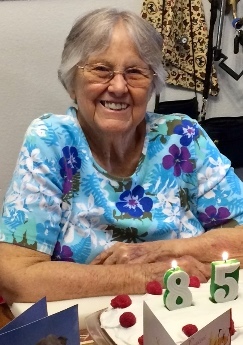 Judy returned home to her Heavenly Father on July 23, 2018. She was born to Leo Ercill and Doris Marie Wallis on July 9, 1933 in East Los Angeles, California. She passed away from Cancer at her home surrounded by family. She married her high school sweetheart “Jack” Wesley Lee Beals on April 25, 1953 and they had four children: Jerry (Penny) Beals of El Reno, OK, Jeffrey (Brenda) Beals of Cedar City, UT, Jay (Laura) Beals of Highgrove, CA, and Janelle Beals Meives of Cedar City, UT, two grandsons, Jared and Jake Beals of OK, Six granddaughters, Sarah Beals White and Amanda Beals of CA, Jodi, Jayme and Jaclyn Meives of CA, Jenna Galvan of Cedar City, UT, three great grandchildren, Merritt, August and Palmer Beals of OK.
She is survived by her siblings: Wayne (Mary Jane) Wallis, Linda Wallis Struble, and Kenny (Marilyn) Wallis. She is preceeded in death by her husband of 63 years, her parents, her first infant grandson, Tyler Wayne Beals. She moved to Cedar City in 1989. She is best known as “Almost Famous” for her artistry and has her paintings displayed in many homes and businesses. She loved anything leopard print and elephants as shown by her huge collection. 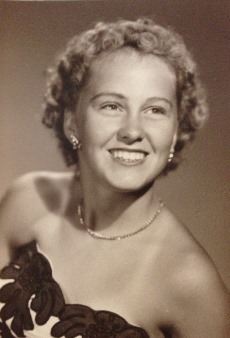 She enjoyed playing tennis, swimming, and had many musical talents. She had many lifetime friends and had a large group of supportive friends in Cedar City. The family wishes to thank Intermountain Hospice, especially the kindness of Nurse Bob and Becky who gave her excellent care and friendship. Funeral Service will be held July 28, 2018 at the LDS Chapel at 3575 N. Minersville Hwy, Cedar City, UT, at 11:00 a.m. Interment will be in the Enoch City Cemetery. Arrangements have been made under the direction of Hughes McArthur Mortuary.